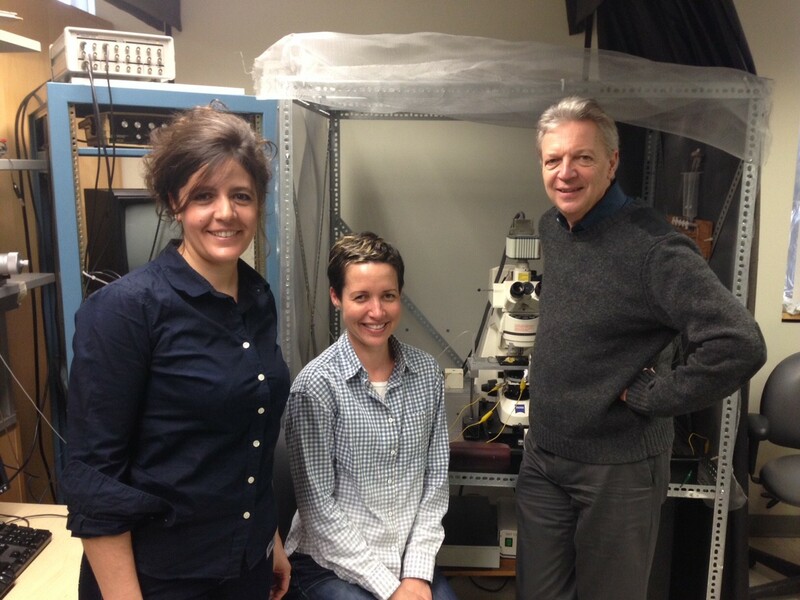 With $161,000 in funding from FRAXA over 2015-2017, the Yale University team of Leonard Kaczmarek, PhD showed that loss of FMRP leads to an increased Kv3.1 potassium currents and decreased Slack potassium currents in neurons. Both of these changes impair timing of action potentials in auditory neurons (and likely others throughout the brain). The team also found that the firing pattern of neurons in response to repeated stimulation is severely abnormal in Fragile X mice. Based on these results, they are collaborating with the UK-based company Autifony to develop and test advanced compounds which may reverse these deficits. Fragile X syndrome (FXS) is characterized by hypersensitivity to many types of sensory stimuli, including environmental sounds. Dr. Kaczmarek and colleagues have shown that, in an animal model of Fragile X, certain groups of neurons in the brain have abnormally elevated levels of a protein called Kv3.1. This protein belongs to a family of proteins, ion channels, which control the electrical excitability of the brain. The function of the Kv3.1 protein is to allow neurons to fire at very high rates. Thus elevated Kv3.1 levels are likely to contribute to the hypersensitivity found in FXS. In collaboration with Autifony Therapeutics, and with the support of FRAXA, the Kaczmarek laboratory has been investigating the actions of new drugs that selectively inhibit or activate Kv3.1. They have found that the neuronal effects of these compounds on neurons in an animal model of FXS are diametrically opposite to those from wild-type animals. In particular, such compounds improve the temporal accuracy of neuronal firing in the animal model. These drugs are now being evaluated in human clinical trials for other disorders, and the ongoing research is aimed at determining which compounds are likely to become useful therapeutic agents for Fragile X syndrome.